Mankind polluted Earth’s oceans and atmosphere in an impressive way. According to the European Space Agency (ESA) it also polluted space in such a way that it represents a danger for satellites for the next 10,000 years ! Additionally, any object bigger than a centimeter represents an important danger for satellites because of their speed. There are up to 600,000 of them in terrestrial space. Think of it as a galactic garbage dump. With a recent satellite collision still fresh on minds, participants at a meeting in the Austrian capital this week are discussing ways to deal with space debris — junk that is clogging up the orbit around the Earth. Some suggest a cosmic cleanup is the way to go. Others say time, energy and funds are better spent on minimizing the likelihood of future crashes by improving information sharing. The informal discussions on the sidelines of a meeting of the United Nations Committee on the Peaceful Uses of Outer Space, which began Feb. 9 and ends Friday, arose from concern about the collision of a derelict Russian spacecraft and a working U.S. Iridium commercial satellite. The Feb. 10 incident, which is still under investigation, generated space junk that could circle the Earth and threaten other satellites for the next 10,000 years; it added to the already worrying amount of debris surrounding the planet. 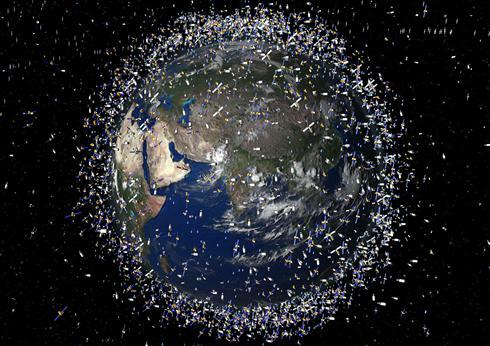 Nicholas L. Johnson, NASA’s chief scientist for orbital debris, said about 19,000 objects are present in the low and high orbit around the Earth — including about 900 satellites, but much of it is just plain junk. He estimated that included in the 19,000 count are about a thousand objects larger than 10 centimeters (4 inches) that were created by last week’s satellite collision, in addition to many smaller ones. He predicted that if more junk accumulates, the likelihood of similar collisions — currently very rare — will increase by 2050. To Johnson, the “true solution” in the long run is to go get the junk — or push it away to a higher altitude before it has time to crash into anything. “Today’s environment is all right but the environment is going to get worse, therefore I need to start thinking about the future and how can I clean up sometime in the future,” he said. Johnson is the co-lead of an International Academy of Astronautics study that is exploring ways of extracting space debris from Earth orbit. Some of the suggestions sound pretty spaced out. One proposes attaching balloons to pieces of debris to increase their atmospheric drag and bring them back to Earth faster. Another, said Johnson, foresees attaching a 10-mile (16-kilometer) electrodynamic tether to debris that would generate a current, which then could be controlled from the ground enabling technicians to bring it down. (…) The European Space Agency has begun a program that goes part way toward meeting that goal by monitoring space debris and setting up uniform standards to prevent future collisions far above the planet. Launched in January, the 50 million euro ($64 million) program — dubbed Space Situational Awareness — aims to increase information for scientists on the ground about the estimated 13,000 satellites and other man-made bodies orbiting the planet. But a worldwide system is unlikely to be created any time soon. While the U.S., France and others have expressed informal interest, no state has pledged official support, Weeden said. (…) He noted that neither ESA nor NASA were able to predict last week’s collision, although his scientists have been warning for two decades that such an accident could happen. I find that simply astounding. If we continue like this, and if we solve the energy / climate equation in time and go in outter space, the worlds we will inhabit will be recognizable by the junk we leave behind us.